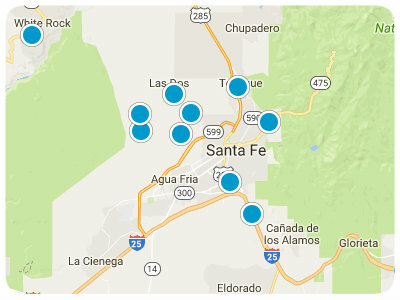 Located in the southeastern section of Santa Fe, New Mexico, the Sol y Lomas subdivision is an excellent place to call home. Available properties in Sol Y Lomas include beautiful single-family homes with mature landscaping and wonderful architecture. Many of the homes have garages. As a resident of this subdivision, you will appreciate its convenient location, gorgeous natural beauty, fantastic residences, easy access to plentiful entertainment opportunities, and much more. Regardless of your interests, you will not struggle to find enjoyable activities to fill your free time when you choose to live in this subdivision. Homes for sale in Sol y Lomas are ready to impress you, so now is the time to consider what it would be like to call this subdivision home. Homebuyers who like spending time outdoors will appreciate the nature and scenery in and around this subdivision. For example, some homes offer views of the Sangre de Cristo Mountains. Furthermore, you will find many places to enjoy the warm sunshine near your Sol y Lomas home. For example, you may choose to play some holes of golf at Quail Run Golf Course or jog along the Arroyo Chamiso Trail. Santa Fe is also home to many enjoyable entertainment options. For example, if you like art, then Santa Fe will impress you with its reputation as an arts hub. Museums and galleries abound, and the Georgia O’Keeffe Museum and the New Mexico Museum of Art are only two examples of places you may go to appreciate wonderful artwork. This city is also full of eclectic dining options, so you are certain to find something that will satisfy your taste buds after an afternoon of exploring. Fun local events such as the annual Santa Fe International New Media Festival, which celebrates artists from all around the globe, and the Santa Fe Farmers Market are also excellent ways to feel connected to the vibrant Santa Fe community. These attractions will all be within your reach when you choose a single-family home in Sol y Lomas. Available properties in this subdivision will not disappoint you. Sol y Lomas real estate options are very enticing, and you will be glad you chose to live in this welcoming subdivision. If you are ready for more information regarding homes for sale in Sol y Lomas, Santa Fe, please do not hesitate to contact us.